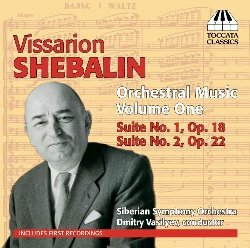 Most students of Soviet music will have heard the name Vissarion Shebalin (1902-1963), but only the most dedicated will have heard any of his music. Along with Shostakovich, Prokofiev, and Khatchaturian, he was one of the high-profile targets of the 1948 Zhdanov Decree, which cost him his position as Director of the Moscow Conservatory. If the Zhdanov episode seems insultingly arbitrary in the cases of Shostakovich and Prokofiev, with Shebalin it seems positively perverse, as Tikhon Khrennikov, one of the main functionaries behind the decree was a Shebalin protégé, and because Shebalin’s music, as presented here, sounds like a perfect example of the Socialist Realism from which these composers had supposedly strayed. It wasn’t the end of Shebalin’s career though. He returned to the conservatory as Professor of Composition in 1951, and continued to compose until his death, although afflicted in his last decade by the affects of a severe stroke. The two suites presented here reached their final forms in 1962 but are based on incidental music written in the 1930s. If there was one marginally legitimate complaint that Chairman Zhdanov could have raised against Shebalin, it was his association with a known subversive, for all the music here was originally written for the Meyerhold State Theater, and one of the works for a production directed by Vsevold Meyerhold himself, who was later tortured and shot by the NKVD, albeit on trumped-up charges. The First Suite contains music for Introduction by Yury German and The Last Decisive by Vsevold Vishnevsky and the Second music for La Dame aux camélias by Alexandre Dumas fils. These suites appear here for the first time on CD, although the wording of the track listing suggests that an analog recording of the Second Suite was previously available. The music is certainly of historical interest, and the release is worthwhile on those grounds, but what do these works have to offer in terms of musical satisfaction for the general listener? Well, that depends largely on your tolerance for Socialist Realism. Shebalin was certainly dedicated to the cause, and strove for simplicity and melodic directness above all else. That, combined with the fact that this is incidental music, makes for sparse and insubstantial music. There are some interesting comparisons to be made with the contemporaneous film music, both British and American, and with the incidental music of Shostakovich. Generally, though, Shostakovich is better able to maintain a sense of atmosphere from similarly Spartan musical means. He’s got better tunes too. Shebalin’s greatest strength, after the disciplined professionalism of his melodic and harmonic constructions, is his imaginative use of the orchestra. In the First Suite, for example, we hear short saxophone solos integrated into the woodwind textures, and a flexatone makes a prominent appearance in the percussion section (surely that must be an addition made during the 1962 edit?). In the Second Suite, the otherwise orderly music is interrupted at one point (in the “Potpurri” movement) by discordant flutter-tonguing trumpets. The recording was made in Omsk in Siberia, the city of Shebalin’s birth, where he is apparently revered as a local hero. The Siberian Symphony Orchestra plays proficiently under Principal Conductor Dmitry Vasiliev, but rarely excels. Intonation and ensemble are fine, but there is little sparkle to the woodwind solos, and little imagination in their phrasing. The brass too sound sullen and monotone, although their balances are reasonable. Almost a page of the liner is given over to information about the recently renovated Omsk Philharmonic Hall, where the recording was made. The new design was by Nicholas Edwards, better known for the acoustical marvels he achieved at Symphony Hall in Birmingham. The orchestral sound certainly seems to be benefiting from its environment, especially the tuttis, which are always rich and warm. The percussion and winds can sometimes sound distant in the quieter textures, but not to the point of distraction. As ever, Toccata Classics gives all the peripheral aspects of this release a high level of care and attention. Both the disc itself and the case are very elegant and, more importantly, a comprehensive liner essay (complete with many footnotes) is provided from Anastasia Belina-Johnson. A worthwhile release then, but not a revelation, one that is likely to be of most interest to students of Soviet music who want to hear the works of the composers they’ve read so much about. This review appears in Fanfare Magazine, issue 37:1.